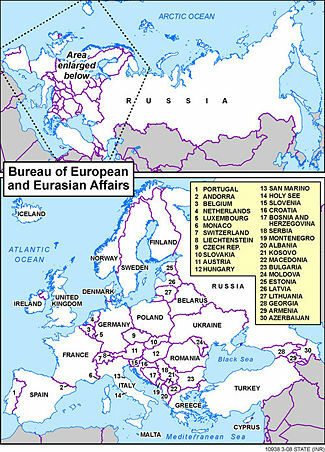 In the U.S. Department of State, the Bureau of European and Eurasian Affairs administers U.S. policy with 44 governments. It also deals with multinational affairs. The Bureau is headed by the Assistant Secretary of State for European and Eurasian Affairs, Philip Gordon. assisted by an (Acting) Principal Deputy Assistant Secretary, Stuart Jones. There are two Deputy Assistant Secretaries, Judith Garber for Nordic, Baltic, and North Central nations; and Matthew Bryza for Caucasus, Central Asia, and Southeast Europe. J. Christian Kennedy is Special Envoy for Holocaust Issues, and Daniel Rosenbaum Coordinator of U.S. Assistance to Europe and Eurasia. This page was last modified 06:32, 1 September 2009.